Lowdown: A heist tale in a world of swords, sorcery and politics. Other than that link to Mass Effect, The Palace Job has a lot going against it. Its author, Patrick Weekes, is not someone about whose literally skills I have heard in the usual places sci-fi fans go to. 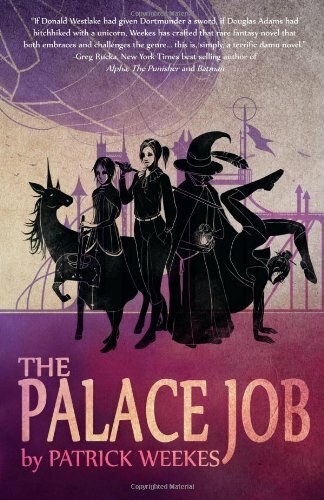 The Palace Job also happens to be a fantasy book of the swords & sorcery type, which I used to like as a teenager but grew fed up of as I grew up and started appreciating substance. I mean, I’ve been finding it quite hard to find good fantasy books that would justify the time spent on their reading. Still, Mass Effect means a lot to me. I gave The Palace Job a go. Things didn’t start out well. Adding to my suspicions were a multitude of characters my gold fish of a memory found hard to deal with. Big mistake, this one, I thought, but continued reading. 10% through I decided I’ll labor on. 20% through I found myself thinking this is actually not too bad. 30% through it was obvious I’m quite enjoying myself. 35% through I realized I was obviously hooked. And by 50% through I was ready to have Weekes’ [metaphorical] children. Turned out The Palace Job was undeniably great through and through. It wasn’t just simply great; it was Mass Effect great. So, what does it take to render a book that is so massively good? I can identify three factors. First we have the plot. The Palace Job is set in a world that seems on a perpetual brink of war. It is also a world of upper and lower classes, literally: the lower classes live on the ground, while the upper classes live on some island that’s floating up there in the sky through magical powers. Magic made possible by the effort of prisoners who work hard on polishing the lenses that help the sun energizing magical things. Prisoners like Loch and her the man always at her side, Kail. We start things off with the story of this couple’s escape from prison. What follows next is the story of this couple plotting to set things right by stealing an elfish artifact from the country’s equivalent of a president. But getting up there in the sky and breaking in to that president’s safe will take more than just door knocking, especially when one's hunted down as an escaped prisoner. Thus our gang of two assembles a proper party of many a weird character they mysteriously happen to stumble upon. And that party sure is eccentric, made of a wizard that's been cast off magic school, a unicorn, a safe cracker, an acrobat, a death priestess, a talking hammer, and a (male!) virgin. The rest of the story is a very Ocean's Eleven type thing with our group going through cycles of outsmarting the baddies only to be outsmarted by the baddies (and let us be clear, there are some pretty nasty baddies about in both this world and the next). It is a very clever affair put together very cleverly. The plot was the first massive thing about The Palace Job. The second are the characters. As stated, there are a lot of characters about; the thing that is so special about them is that without exception, they are all very well developed. The Palace Job is not your regular case of one round character accompanied by a few NPCs. Instead, this is a case of a few very well rounded characters accompanied by many fairly round characters. When you add the story line of a group of special people led by one hell of a leader to perform the improbable, this rings a loud bell: this is exactly what us video game players did when we played Mass Effect 2 through. And just like Mass Effect, there is a whole lot of liberalism about these characters of ours: there are roughly equal numbers of males and females. Indeed, just like the better option of Mass Effect has the player playing a female character, The Palace Job's lead character is a woman. Not only is she a woman, she is also black. The amount of praise that's to be bestowed on Patrick Weekes for this matter alone is virtually endless: I doubt I ever read a book before where the main character was a black female. Oh, and one last Mass Effecty thing: there is plenty of humor and sexual innuendos about as our character interact with one another. I am down to the third and last massive factor going for The Palace Job. That factor is politics! Yes, you read it right. Because The Palace Job is not just your simple Ocean's Eleven trick upon a trick kind of a story; The Palace Job has a very specific message to deliver, and that is the need for us to be aware of what's taking place around us if we are to consider ourselves good citizens. We need to pay attention to the news, be inquisitive and ask questions. It is no coincidence the world Loch is set in is a world that smells a lot of today's America, with its War on Everything and citizens kept in a state of fear on one side as well as a widening gap between the slight few that have it all and the vast majority of others that don't. Weekes is clearly trying to tell us something here, which is exactly why his book goes far beyond the simplistic realm of swords & sorcery most fantasy books are stuck at. Now add all of the three ingredients together and you have yourself a book that I found to probably be the most entertaining work of fiction I read in years. A worthy creation from the house of Mass Effect if ever there was any. Overall: Good fantasy books are truly hard to come by, but Patrick Weekes sure did it. The Palace Job is both entertaining and thought provoking. I pity Weekes being virtually unheard of in the fantasy/science fiction arena as a book writer, but then again - as long as he promises to write more stuff of The Palace Job's quality, I'll live with that. 4.5 out of 5 stars. P.S. Just the other day BioWare announced Weekes will be one of its team member to attend July's PAX Australia gaming expo at Melbourne. I am looking forward to potentially meeting him in the company of my six years old gamer. It's just a pity he cannot sign a copy of my ebook! I bought it after your post, but didn’t get to it before now because of all the Hugo reading. My experience was somewhat different – I thought the beginning was great, and found the book slightly less interesting after about the halfway mark (i.e., once the heist was finally under way). And the ending was also a little “so?”. The book’s characters die 3-4 times on the average, and while some of the things Weekes does are surely meant as a parody (of fantasy novels, of heist stories, of modern society, …), I’m not sure this was, and it was a little annoying after a while. Also the fact that he has a little too many impossible-to-kill super villains (and then proceeds to kill all of them). If it were a movie (or maybe just a non-ME-related book) I’m sure you would have complained about it having too many twists. But don’t think I didn’t like the book – It was funny and entertaining and I enjoyed reading it. I'm pretty sure that getting in sync with Weekes' sense of humor, either through Mass Effect or through Twitter, helped me enjoying the book. Now, with the benefit of some time behind my reading, I can say I liked it for the humor and the political statement; I also thought the "against all odds" factor was acceptable for the genre. Or, in other words, I actually enjoyed it: it did remind me of Ocean's Eleven. And the coming back from the dead - isn't that something that always happens in movies and/or video games? At the personal level, I'm always at odds with fantasy. I like it a lot, but I hate to waste my time on cheap swords & sorcery. The Palace Job gave me the entertainment but made me think I wasn't wasting my time because of the political statements it made. Weekes said on Twitter he's working on a sequel. It's definitely going to be a book I'll rush to get.